Ronny, do you know what the NETest by Wren Laboratories detects? Some say it is based on DNA evidence of NETs. Have you had any experience with it? They have a lab in London as well as the US. Thanks. The neuroendocrine neoplasms test (NETest) is a multianalyte liquid biopsy that measures neuroendocrine tumor gene expression in blood. This unique signature precisely defines the biological activity of an individual tumor in real time. The assay meets the 3 critical requirements of an optimal biomarker: diagnostic accuracy, prognostic value, and predictive therapeutic assessment. NETest performance metrics are sensitivity and specificity and in head-to-head comparison are 4-fold to 10-fold more accurate than chromogranin A. NETest accurately identifies completeness of surgery and response to somatostatin analogs. Clinical registry data demonstrate significant clinical utility in watch/wait programs. However, I don’t see much uptake in the NET Medical world. Not sure why yet. This was helpful in the fact that I read the daily updates provided and have been questioning if I need to be connected somewhere else. Not that I would leave this very helpful group, but I have medullary thyroid carcinoid tumors in my upper chest/neck area. None on the thyroid itself. So with that said and after reading your informative article about all the different tumor markers. When it came to calcitonin there wasn’t any information given. If you know of a specific group in that primary I would appreciate it so much. And BTW Ronnie, it truly is amazing that you take the time to do what you do. Thank you for the informative blogs.This particular one on markers caught my attention. my mother was diagnosed 3 years ago. 2.3cm primary tumor in the stomach with metastasis to the liver 23cms. she has been on sadostatin, primary tumor no longer visible in scans, liver mass down to 17cms. No surgery recommended. Last 6 months cga has been going up. Doctor proposing a dotanc scan to give her direction in treatment plan.what is confusing is despite elevated cga,liver mass remains the same,no carcinoid symptoms,she is not on any ppi.she is onlyon a blood thinner. Why the cga elevation? updated it, thanks for the prompt. While doctors in the US (as anywhere) surely have their preferred markers/tests, I’m finding that more doctors are patient specific when ordering tests. As with everything with this disease, we’re all different. One text for one person may be very indicative of what their disease is up to, that test for another patient may not be as good of an indicator. For example, CgA has always been right on the nose in terms of what my symptoms and scans are showing, so my doctors order it fairly regularly or if I have a sudden change in symptoms. Here’s my question. I didn’t realize that it’s an indicator of bulk or load. Why is it that my CgA changes, dramatically even, while my tumor load does not? I’ve never had surgery. When I started Sandostatin, my CgA dropped from the 2000 range to 250. My tumor load didn’t change. Thanks! yes, we are all different and many have other illnesses to contend with, some which may be impacting on stability and test results. I can’t really explain why your results are what they are but many reputable sites will tell you that that is what CgA does. I did read one text which said that CgA could decrease as an indicator of therapy success but it didn’t really elaborate how much or what therapies. So, there’s a potential link there. Thinking back to my own experience, my CgA did not reduce after my first surgery (primary small intestine) which coincided with start of Lanreotide treatment. It did, however, return to normal after my liver surgery which would indicate a bulk change. It’s also possible to have a one off increase or reduction and then it goes back to previous trend. Do you have a trend yet? As I wade through this complex disease I am alway grateful for your dedication to get the word out. How is it that your exact article pops up right when I need it. Some info is still not computing- I think it’s my brain fog. I can still use this as a jumping off place to ask my doctors to help with this Jigsaw. Please keep carrying the torch! Thanks, keep spreading the word! Another great post, Ronnie. Very informative — thank you! Thanks for that article,Ronny. I also by accident or one of your articles found the “diat” to take care of befor the urine test…got the information information from my Doc after asking! I have another question, if somebody nows about this “side effect” of NET: destroying of nerves. I have some funny feeling in my feet since 5 or 6 years and went to the neurologist. He didn’t find any signs for the to expected diagnosis (Polyneurophathy). I discusse my NET (little intestin, operated 1,5 year ago but sitting there – of course – pretty some years) and he found in the WEB an article that said, that nerve damage is one of the side effects of that illness. Does anybody know anything about this subject? Would be a great help! Thanks! Another excellent interesting article. Great news about the new test – always hate restricting diet. I only do it for 2 days plus sample day, so will have to try 3 days. Also can confirm problems of measuring in different areas. 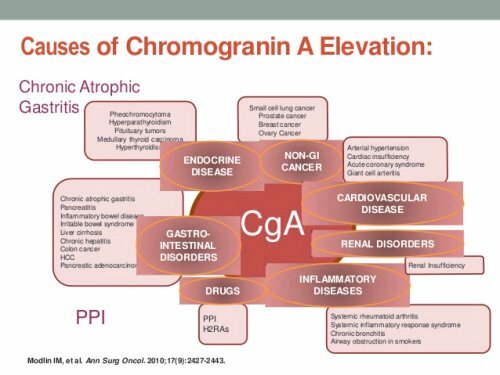 Have recently transferred from Royal Free to Coventry’s Walsgrave and they measure the Chromogranin A in different units. Next Next post: Neuroendocrine Cancer: Patient Power!